Home Cupid-4-Stupid Archive for category "for Android"
Today, November 28 of 2011, we released a new update of Cupid-4-Stupid! Some customers reported a bug that they were facing when trying to access content in Date Ideas and Panic Button sections. This bug was produced after all the Android devices got updated. After working around we found out what was the problem and solve it. Soon, we will release a more detail explanation of how we solve it. 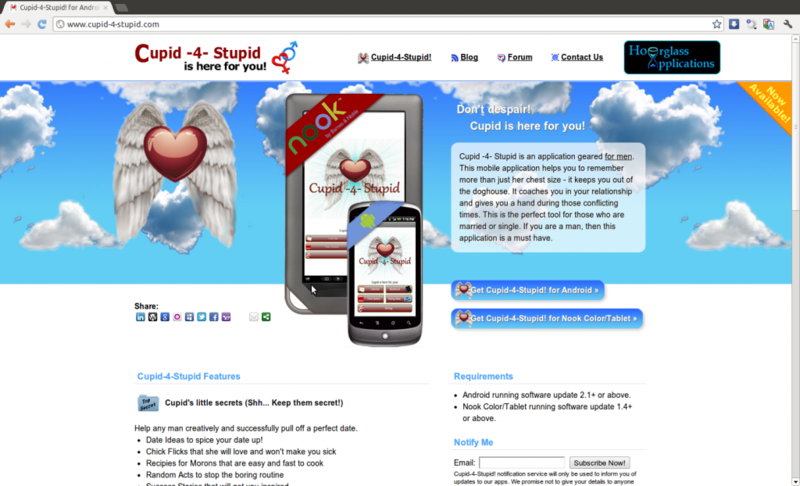 We are adding BugSense to Cupid-4-Stupid (http://www.cupid-4-stupid.com) for Android. BugSense (http://www.bugsense.com/) is a bug tracking service for Android, iOS, and WP7 which works wonders with ACRA 4.2.3. We added BugSense after encounter an error with ACRA in which was crashing the application. After spending long hours I found how that the error was produced when ErrorReporter class was not initialized. For some reason ACRA 4.2.3 doesn’t pass the reference of the class (this) to ErrorReporter.